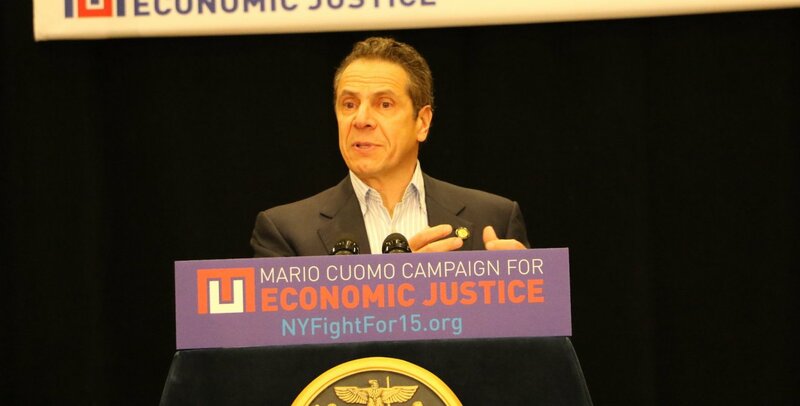 Background - On May 7, 2015 Governor Cuomo called on NYS DOL Acting Commissioner Mario Musolino to appoint a wage board to study and make recommendations on the impact of raising the minimum wage for fast food workers. In September of 2015, after 10 weeks of study the NYS DOL on the recommendations of the wage board decided to phase in a $15/hour minimum wage by December 31, 2018 in NYC and 2021 for the rest of the state for fast food workers. On the heels of the wage board’s recommendations Governor Cuomo did a press conference with Vice President Joe Biden announcing a proposal of a statewide $15/hr minimum wage on September 10, 2015. Two months later Governor Cuomo issued an Executive Order elevating the minimum wage to $15/hr between now and 2018 for NYC and the rest of the State by 2021 for NYS Employees. He’s included a $15 minimum wage for all workers in his agenda for the 2016 legislative session, a proposal that has been staunchly opposed by the NYS Senate. Big Picture - The economy will have increased consumer spending and fewer people on public assistance as a direct result in the increase in wages for low-wage workers. NYS Labor Law - Current NYS Labor Law exempts federal, state and/or municipal employees from minimum wage requirements. Note: Gov. Cuomo has said he’ll execute raising the NYS minimum wage for NYS employees through the Department of Budget and will look to change labor law to prevent future governors from rolling back his Executive Action. Public Benefits - According to a brief issued by the Fiscal Policy Institute in partnership with the National Employment Law Project an increase in the state minimum wage would yield significant savings for New York State, and municipal governments within the state in excess of $1 billion contingent on the level of increase. Budget Savings - The Washington, D.C.-based Urban Institute conducted a study evaluating an increase to $15 an hour for NYC only and saw an aggregate increase of $7.7 billion spread across 1,044,000 worker. They focused on New York City, but said the results are conceptually similar in the case of workers across New York State. Political Landscape - We care about the minimum wage, because increasing it is good economic policy, but as of late it has proven to be good politics. A September 2015 Quinnipiac poll said 62% of NYS voters support raising the minimum wage to $15/hour. 77% of New York City voters support it, and in somewhat of a surprise this policy prescription performs almost as well in the suburbs with 66% of suburban voters supporting the increase. Highly sought after independent voters support it by favorably 59% - 38%. Minimum-wage workers are better educated today than ever before, but they are paid less than they were thirty years ago. The share of workers at or below the federal minimum wage who had some college education increased from 19.5% to 33.3% between 1979 and 2011. Contrary to popular belief, low and minimum wage workers are not all teenagers. Nationally, 75% are over the age of 20.